I was watching America's Test Kitchen Public TV Series last week, they were making foods from St. Louis, Missouri i.e. St. Louis Ribs, and St. Louis Pizza! So, I thought I'd give this pizza a try and let you know what Will and I thought. Bake in a 475 degree F. oven on parchment paper. 2 cups shredded white American cheese (I used mozzarella, some St. Louis recipes use cheddar cheese and provolone). 3 drops liquid smoke (Wright's Liquid Smoke is the real deal and really adds flavor). 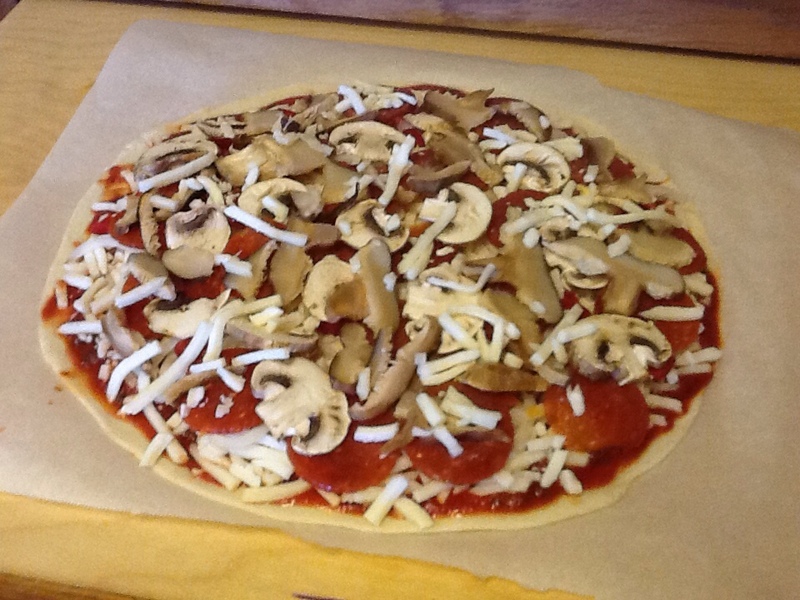 I used peppers, thinly sliced onions, mushrooms and pepperoni. Use whatever toppings you enjoy! 1. PIZZA SAUCE Whisk together tomato sauce, tomato paste, basil, sugar, and oregano in small bowl; set aside. Toss cheeses with liquid smoke in medium bowl; set aside. (You'll end up with lots of extra sauce). 2. MIX DOUGH Combine flour, cornstarch, sugar, baking powder, and salt in large bowl. Combine water and olive oil in liquid measuring cup. Stir water mixture into flour mixture until dough starts to come together. Turn dough onto lightly floured surface and knead 3 or 4 times, to make a smooth ball. 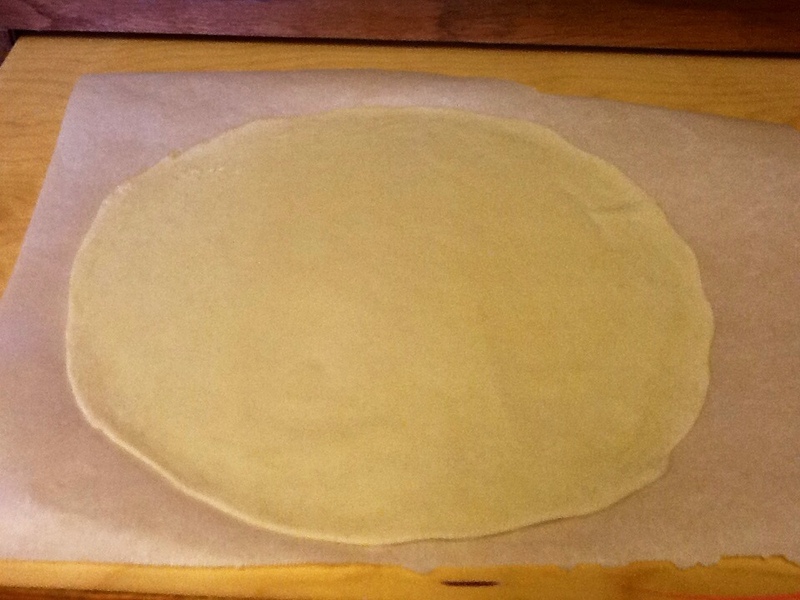 Roll out pizza dough to 12-inches on lightly floured parchment paper. 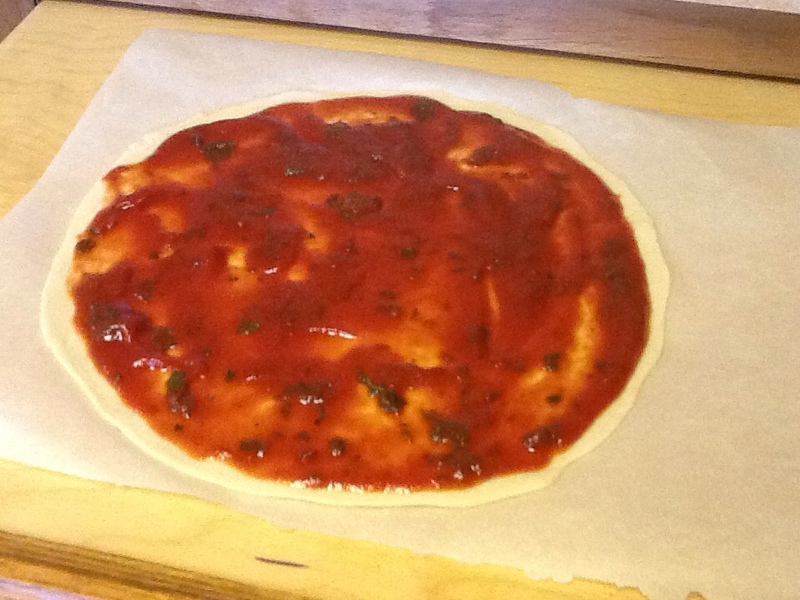 Spread pizza sauce evenly with the back of ladle or large spoon. Add cheese and toppings of choice. 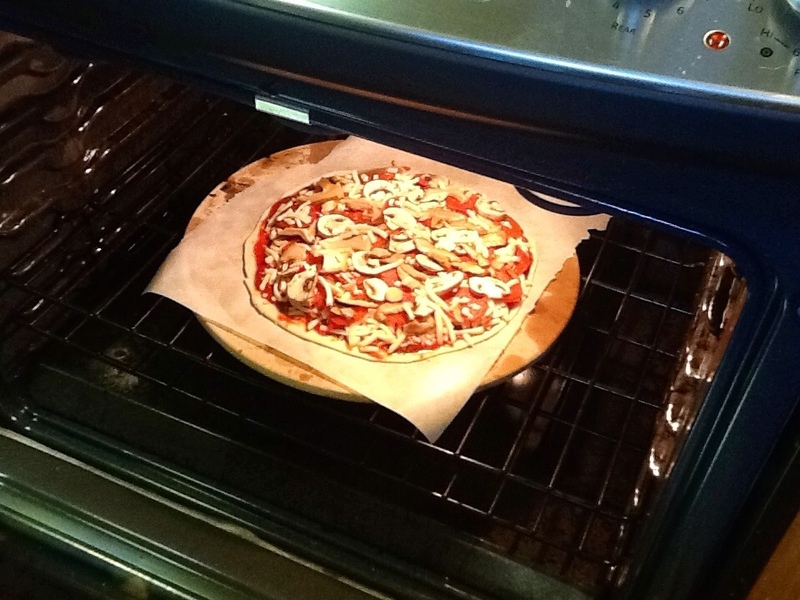 To move pizza to oven, slide onto an inverted baking sheet. Keep pizza on parchment to bake. 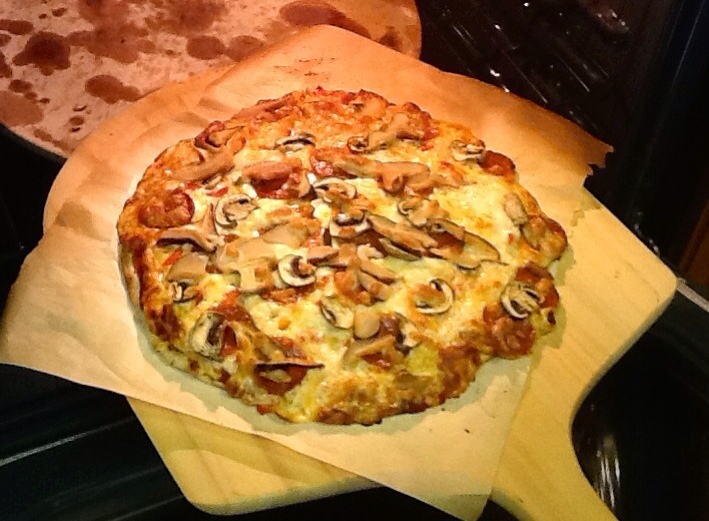 Transfer pizza by sliding off inverted baking sheet onto pizza stone. 4. ASSEMBLE PIZZA Top each piece of dough with sauce (use the back of a ladle or large spoon to spread sauce evenly) and half of cheese. 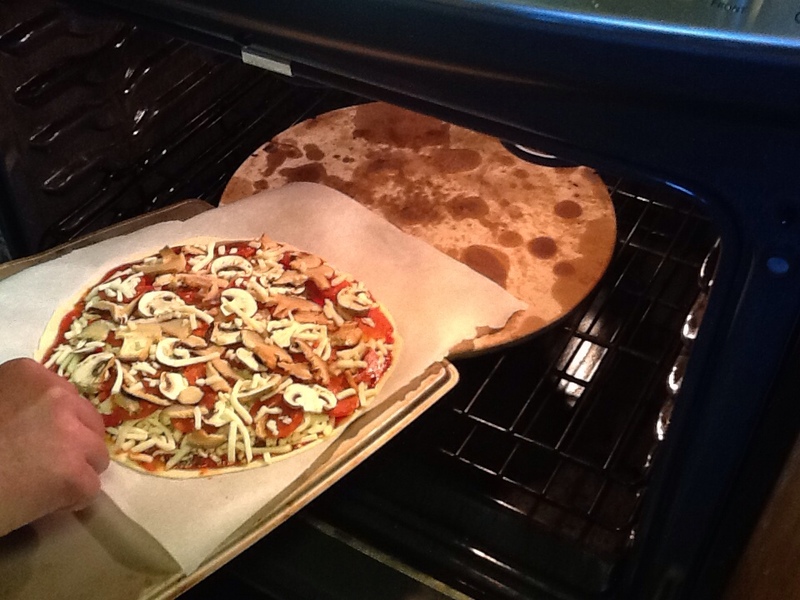 Carefully pull parchment paper and pizza off baking sheet onto hot baking stone. Bake until underside is golden brown and cheese is completely melted, 9 to 12 minutes. Remove pizza and parchment from oven. Transfer pizza to cooling rack and let cool few minutes. 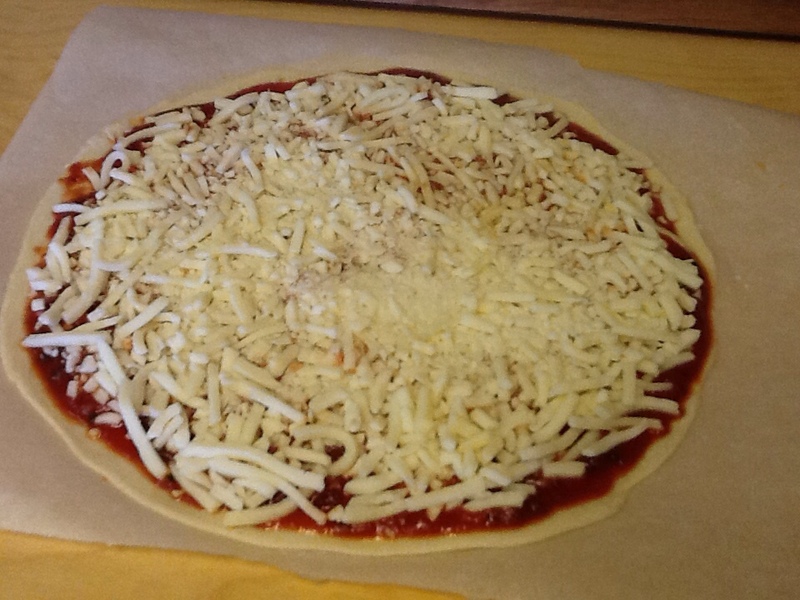 Assemble and bake second pizza. Cut into 2-inch squares. Serve. MAKE AHEAD: The dough can be made in advance. At the end of step 2, tightly wrap the ball of dough in plastic and refrigerate for up to 2 days. Pull from oven when crust is browned and cheese has begun to turn golden. St Louis style pizza is actually really good. I like to fold the slice and eat it as a sandwich. Thanks so much for your comment! It's really great connecting with St Louis pizza folks! Love the video with the locals sharing about why they love St. Louis style pizza!